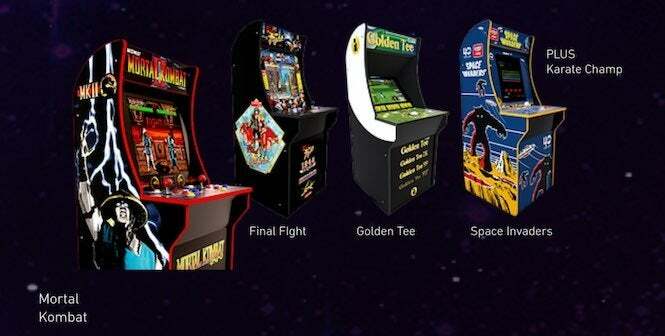 Late last year, we took a look at the line-up of Arcade1up games, which allows fans to revisit the feeling of old-school arcade games, but without having to actually acquire and maintain one of those high-priced machines. While they’re not without their flaws, these games have the potential to be big hits for collectors and casual players alike. And now the brand is expanding with five new entries, introduced today at the Consumer Electronics Show in Las Vegas. Arcade1up introduced returning favorites that will be available this year, and there’s one in particular that will be noteworthy to fans of fighting games- Mortal Kombat! The original arcade trilogy, consisting of Mortal Kombat, Mortal Kombat II and Ultimate Mortal Kombat 3, will make their return in Arcade1up form, complete with authentic controls, a sharp-looking screen and all the fatalities that you can muster. You can catch a glimpse of its design in the tweet below. The Mortal Kombat cabinet, like all Arcade1up games, is set to be priced around $299 and will make its debut this September. But that’s not all, as four more games will be available over the course of the year. First up is a Capcom devoted machine coming next month, which will feature Final Fight, the classic beat ‘em up, along with 1944, Ghosts ‘n Goblins and Strider. A Space Invaders dedicated cabinet will also be available in February, including the original black and white Invaders, along with a color version of the game. Coming up in June will be Golden Tee, a home variation of the hit arcade golf game. It will include GT Classic ‘01, along with Golden Tee 2K, Golden Tee ‘99 and Golden Tee ‘98. It will include an authentic trackball for that proper feeling of golf club-swinging gameplay. Finally, joining the Mortal Kombat cabinet in September will be a Karate Champ Arcade1up unit, which will feature a handful of Data East classics. Along with the tactical fighting game, it will include Bad Dudes vs. Dragon Ninja, Burger Time and Caveman Ninja, also known as Joe & Mac. You can catch a glimpse of the games in the flyer image below, taken from Resetera. No doubt there’s an Arcade1up unit here for everyone, but we’re all about that Mortal Kombat- especially with part eleven coming our way in just a few months. You can learn more about the Arcade1up games on its official page. What arcade games would you like to see join the Arcade1up lineup? Let me know on Twitter at @TheDCD!